Volunteers from the climbing community and the Truckee Donner Land Trust worked to paint over the graffiti on the outside of the snow sheds on Donner Summit on Sunday. The project was part of the Adopt a Crag initiative to restore the Blackwall property. Graffiti on the outside of the snow sheds on Donner Summit will no longer be visible due to the work of volunteers who painted over the walls on Sunday. For years graffiti has been present on the inside of the tunnels and deemed acceptable by most in the climbing community. In the past few years, however, it has showed up on the outside of the walls and continues to spread to the rocks near the climbing walls, according to Logan Talbott, a mountain guide for Alpenglow. Talbott said the general consensus of the climbing community is graffiti on the inside of the snow sheds is acceptable. Recently he has seen the tagging show up all over the area, including graffiti on federally protected petroglyphs in Donner Summit. “We find that extremely offensive and damaging to the local environment,” he said. 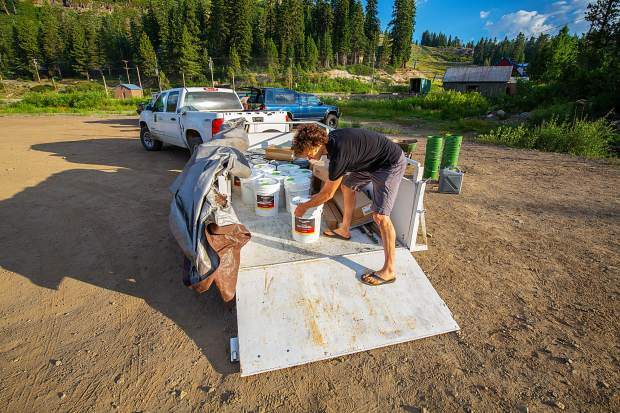 On Sunday around 25 volunteers, including local climbers and representatives from the Truckee Donner Land Trust, which helped organize the event, restored the outside of the snowshed to its original state using 70 gallons of tan-colored paint to blend in with the environment. Talbott said the next project will focus on removing graffiti from rocks outside the train tunnels, a laborious and tedious process requiring more time and a bigger group of volunteers. “It’s a really tedious and slow process,” he said. To do this they will need paint remover and a direct water supply to wash the paint off the rocks. He said the only way to get the job done is by driving a water truck to the site which requires access to the road currently owned by Union Pacific Railroad Company. Despite multiple attempts to get in contact with the railroad, the group has not heard back. For the past 50 years climbers have been setting routes on Donner Summit. In 2015 local climbers from Access Fund and Truckee Donner Land Trust purchased the 11.9-acre property, known as Blackwall, from private landowners with the intent of preserving it for outdoor enthusiasts in the future. This past weekend’s restoration project, which included trail improvements to Blackwall climbing area, took place in conjunction with REI’s climbing festival at Sugar Bowl over the weekend. Part of the proceeds from festival registration fees and auction went toward the land trust for future restoration projects including iconic climbing areas. The repaint of the snow sheds was one of many projects that have been ongoing all month as part of the Access Fund’s Adopt a Crag initiative. There will be two more projects at Blackwall, one Saturday and a second on July 28. More information can be found on the group’s Facebook page.